Hi all! If you follow me on Instagram, you're probably already aware of the reason for my recent radio silence over here. I've just got back from my travels to Japan, where I had the most amazing time and managed to make it to Tokyo's infamous Nippori 'Textile Town' district for the most overwhelming fabric shop of all time (more on that soon). 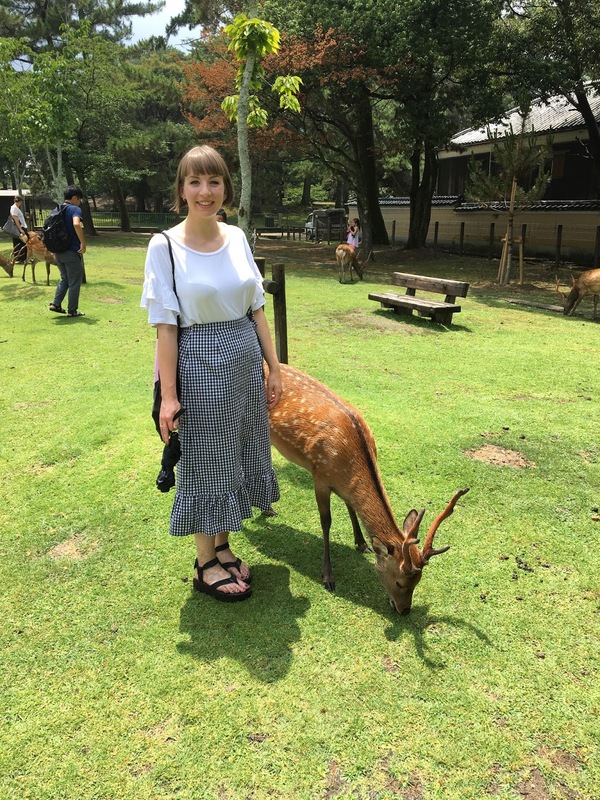 In a pre-trip panic over (extremely) warm-weather-appropriate clothes, I managed to stitch up a few new garments that I'll be sharing over the next couple of posts. First up, here's a Sew DIY Nita Wrap Skirt hack. I've made the Nita Wrap Skirt a number of times (first up as a pattern tester) and I've always found it an easy pattern to get a bit experimental with - see previous attempts in denim and pleather. The inspiration for this gingham ruffle hack came from a couple of fab skirts by Jess and Daisy, as well as a strong and continuing high street trend for gingham garments. 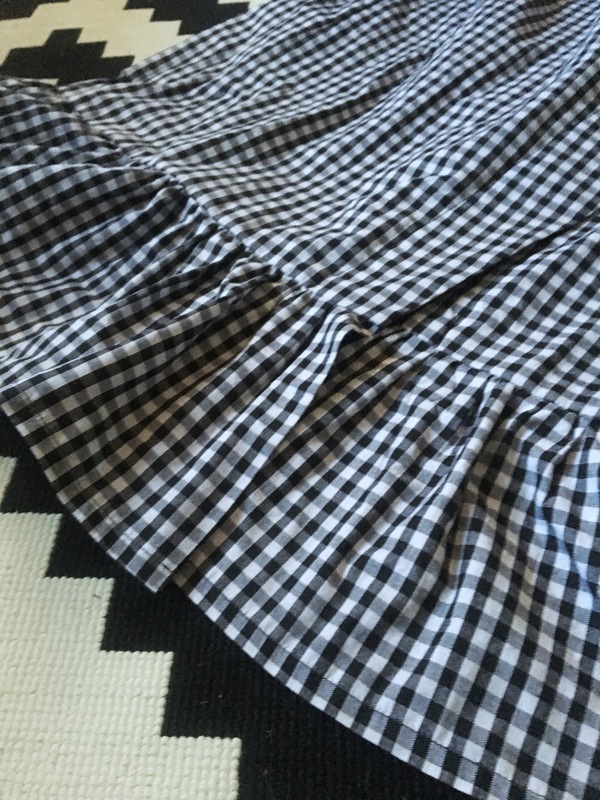 It's not often that I sew with straight cotton as a serious fan of the drape, but I thought this light-ish weight gingham would work for both the skirt and the high temperatures in Japan, plus it was a bargain at just £2.99 p/m from Samuel Taylors in Leeds. The fabric holds the gathered ruffle perfectly, so I'd be tempted to do a repeat of the hack in a similar fabric. I made view B, shaking up the order of construction a little to make room for the addition of the ruffle hem. This meant sewing the darts and side seams of the skirt up first, but joining the ruffle before finishing the front edges. The ruffle was cut at 20cm deep, and each piece (2 for the left/right front skirt and 1 for the back) measured 1.5x longer than the skirt piece it was being gathered in to. I stitched the pieces together and hemmed the bottom and sides before gathering the raw edge in to fit the skirt, matching at the side seams and the notch where the front pieces are folded in to finish the wrap edges. Hope that all made sense, but of course, do let me know in the comments if I can make it clearer! How much leg is too much..? I love that the depth of the ruffle makes the skirt midi-length. 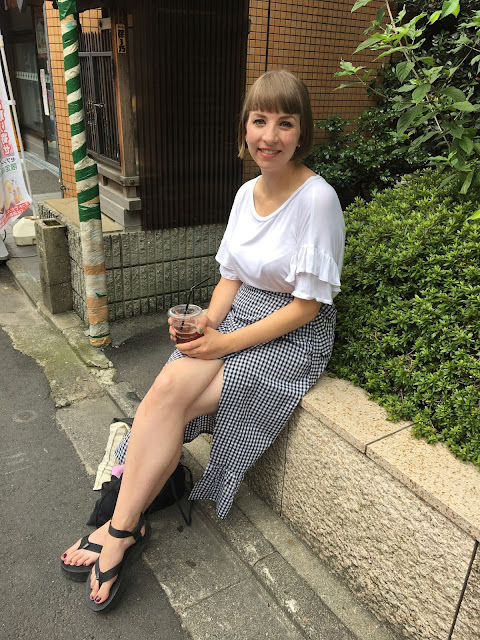 I hadn't originally intended for it to be this long, but I feel like it offers that extra bit of modesty to make up for the inevitable amount of leg flashing you get when sitting down in a wrap skirt (I'm sure you guys know what I mean)! I used the tie fastening option rather than D-rings, so not to weigh the fabric down. 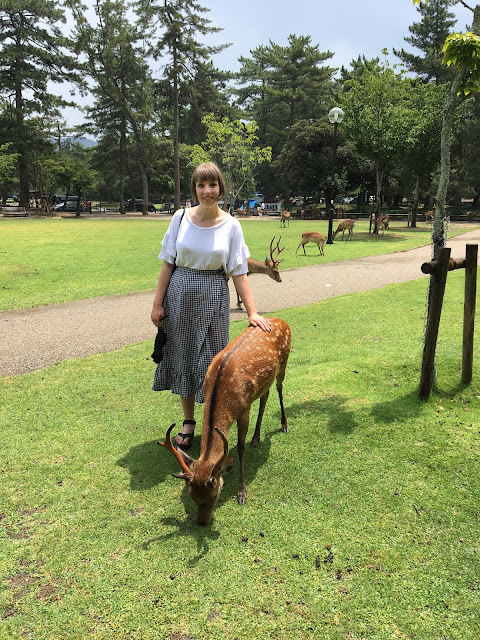 I found that this worked really well, though when we visited Nara whilst in Japan, the savvy deer worked out the fastening (or unfastening) of the skirt quicker than I could unwrap the crackers that we'd bought for them. Thank god I bothered to add the inside snap fastening to this Nita! 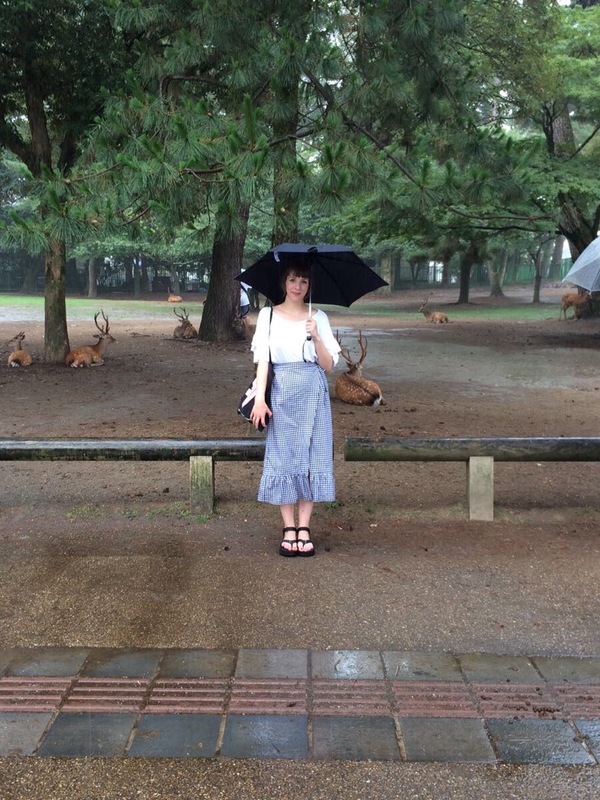 (See candid deer feeding shots below for more skirt, but really just for more LOLs). 'Give me those crackers or the skirt gets it'! Thanks Chris for capturing some of my finer moments in Nara. The deer might not like it, but I love this version of the Nita Skirt. 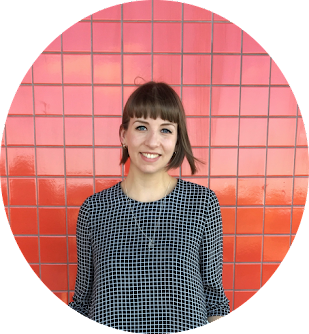 I'm hoping to be able to transition it through to autumn/general British weather with tights and a Papercut Patterns Fall Turtleneck! 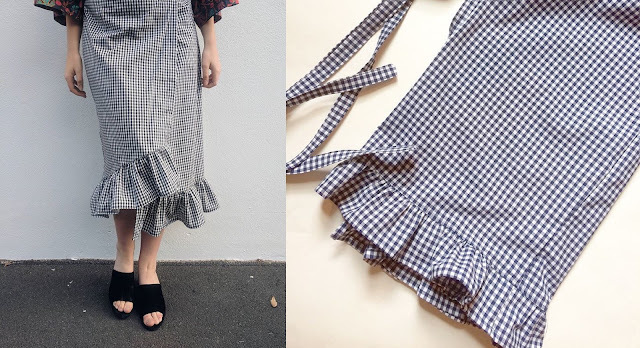 I'd love to try a slightly asymmetric hem like Daisy's above, or maybe a ruffle along the front diagonal edge - maybe another one of these is on the cards!